Quick and delicious, this veg fried rice is packed with lots of vegetables and fusion flavours. Sauté a mix of vegetables; season with some soya sauce, vinegar, salt and pepper; and then mix in the cooked rice. The recipe is very easy and even if you have to make the rice, it only takes about 30 mins from start to finish. When the Chinese settled in Eastern India over a century ago, they developed a unique Indo-Chinese cuisine by adapting Chinese seasoning to Indian tastes. Before they knew the cuisine spread to the rest of the country and today, many high-end as well as roadside eateries cater to the local demands of Indo-Chinese food. A lot of these old settlers still own and run Indo-Chinese eateries in Kolkatta and rest of India. 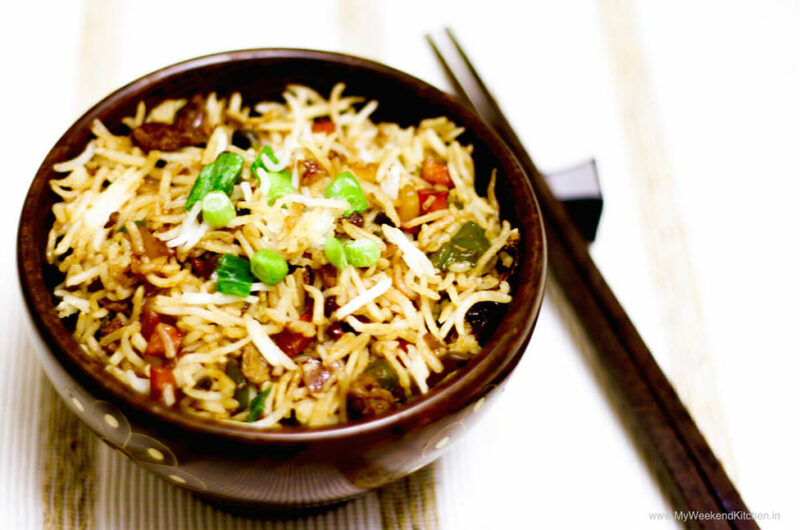 Veg fried rice is a quintessential Indo-Chinese cuisine dish and a popular Indian street food. I have spent many an evenings standing out a roadside food truck waiting for my plate of perfect vegetable fried rice or egg fried rice. Veg fried rice is not a childhood memory food but it is also my go-to recipe to reuse leftover rice. Other delicious ways to reuse leftover rice are by making them into rice fritters or chawal ke pakode or a quick tomato rice. In this recipe I use a mix of carrots, red and green bell peppers and spring onions, but one can use any mix of vegetables. Mushrooms, celery, french beans, peas, corn, and/or tofu will go great in this fried rice recipe. Also, I have used unpolished sela basmati rice. Sela basmati is made is such a way that at least 50% of the nutrients of the husk are transferred to the rice grain. But substitute it with brown, or red, or wild, or a mix of these rice varieties for added fibre and nutrition. This veg fried rice recipe is vegan and naturally gluten-free. It is an easy, quick and healthy lunch box recipe and great as a dinner main too! Quick and delicious, this veg fried rice is packed with lots of healthy vegetables and fusion flavours. It is a perfect lunch box or dinner recipe. Vegan & gluten-free. Wash the rice (in a strainer) under running water until the water runs clear. Soak in 2 cups of water for 10-15 mins. If using brown rice, the soaking time will be longer. In a pot, bring 2 cups of water to a boil. Add about 1 tsp salt and oil. Drain the soaked rice and add to the boiling water. 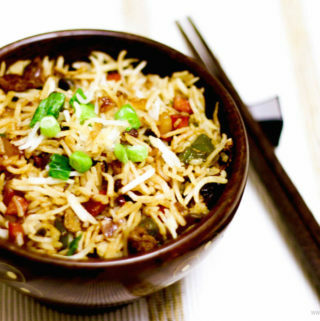 Let cook on medium-low heat until the rice is cooked through and all the water has been absorbed. Takes about 10 mins. While the rice is cooking, heat the Olive-pomace oil in a pan or wok. Once hot add the black sesame seeds. Fry for a few seconds. Next add the chopped garlic, ginger and chillies and sauté for about a minute. Add all the chopped veggies except for the green onions. Mix well and stir fry for about 4-5 minutes. The veggies have to be just slightly cooked so that they retain their crunchiness. Add the chopped green onions (reserve a little for garnishing), all the seasoning and raw sesame oil. Toss and mix well to coat all the veggies. Stir fry for just about a minute. Add the rice and stir fry for another minute till the rice, veggies and seasonings have all come together nicely. Serve the fried rice hot with some chilly or tomato sauce on the side. Chose your grain: Instead of rice, you can also use quinoa, amaranth or other millets. Chose your veggies: Different veggies of choice can be used with the recipe but choose a mix of crunchy and soft vegetables. Did you try this recipe? What are your favourite vegetables to add in fried rice? Check out more of my Rice Recipes here. Leave a comment or connect with me on Facebook, Twitter, Google+ or Pinterest. Would love to start a conversation, share recipes, cooking experiences and food stories from India and around the world. Thank so much for mentioning it and I love it! I don’t mind it all! In fact I learnt only during a trip to Vietnam last year that soy sauce contains gluten and from then on, I started buying and using gluten-free soy sauce as my husband has gluten sensitivity (he is not allergic so does eat wheat once in a while). I know there is a big list of food items where one would not suspect gluten but they have gluten. I would love to know more such food items. For me oats were always gluten free until I realised that since they are most often than not grown with wheat, they have gluten contamination so now I am very careful in picking up gluten free oats as well.